Grandpa usually carried some sort of small, two-blade knife and used it for everything from cleaning out his pipe to cutting apples in the back yard so he could sprinkle them with salt. I've carried a pocket knife since I was in 8th grade (minus the time a nun confiscated it for the rest of the school year). 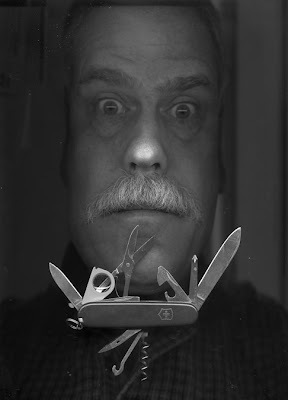 Today I carry a Swiss Army Knife – more of a multi-tool than a knife; Still, I think Grandpa would approve. It's part of me. Occasionally, I misplace her and, well, I panic; turn the house, cars, and office upside down until I find it. I was thinking about that this morning as I started to journal. Pens and pencils, when combined with imagination, are great “multi-tools.” With them you can craft narratives, novels, humor essays, urban realism, poetry, Sci-Fi, fables, Stream of Consciousness writing, Haiku, and yes, even blogs. So, I have two suggestions for Knights today. One, go out and purchase a good pocketknife. Second, use your own built in “multi-tool” and carve out a good story – maybe start with a lesson your grandfather taught you. Oh, by the way, my Swiss Army Knife has a tiny pen – in case of emergencies. Great blog. Scary photo, but cool! I carry my faitful Case and a Swiss in my laptop case. I also have a collection of pocket knives from my dad & both grandfather's. The privelage to carry is not extended to my air travels or to my son at school. It's harder to be a good man in today's world! but in the UK it is ever becoming an offence to carry a knife outside of home. The Red swiss still seems to be a sign of someone wanting a tool and not the speediest of fight weapons, but of the last year i have had it confiscated many times, for the duration of a pub or club visit, and on one occasion, a bouncer who i thought it prudent not to argue with, took the knife and opened the main blade, jammed it in a door crack and snapped the blade off and gave it me back. I still use the other two blades if i need them. What the hell is wrong with this world? Since the days of sharp flint, men and women have carried pocket knives! Write your elected leaders -- the pen is mightier than the pocket sword!